"Paradise" is not a name we gave to our garden. It is rather the result of the reaction of many visitors here -- "This is paradise!" 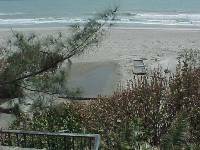 Located directly on the Atlantic Ocean in Cocoa Beach, Florida, the property is an acre and a half, all gradually transformed into a very unusual garden. I designed and built the house in 1973. It was planned for and constructed within a lovely grove of Australian Pines (Casuarina equestifolia) which were killed by severe freezes in 1984 and 1985. Nature compensated by allowing many seeds to germinate, such as the cabbage palms (Sabal palmetto) and Brazilian peppers (Schinus terebinthifolius) which have become an integral part of the foundation planting. Though the death of the trees was extremely painful, their loss allowed both space and light for the ponds to come. Perimeter foundation plants such as sea grape (Coccoloba uvifera), Carissa grandiflora, Vitex trifolia and Agave were planted from 1973 to 1983. Killed to the ground in 1984, 1985 and 1989, these plants recovered to their former sizes in a few years. Ben and I were married in 1989 and the rest of the garden is all Ben's fault. "Wouldn't it look nice if. . . . ." The garden is nineteen years old or less. There has been no real plan. Each area has dictated what it wanted to be and what wanted to grow there. It is a constantly evolving series of micro-environments. The original ponds were the central Classical Pools on the south side of the house, built in 1978. The Devon Pool was added in 1983. Other ponds have been built in a vicious circle - dig a hole to get dirt to fill waterlily pots, eventually make the hole a pond to fill with waterlilies, dig a hole . 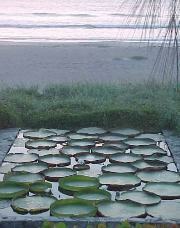 . . All ponds are concrete, most knee deep, some with dirt added back to simulate natural bottom. We stopped counting the ponds, all shapes and sizes, at 50-something. Gifts from Mother Nature are welcome in Paradise. Many of the plants are native or have showed up perhaps courtesy of birds. If they are attractive they are encouraged as actively as the exotics. We keep a detailed accession record but certain entries are necessarily sketchy. We usually choose small starts of new plants, the more unusual the better! Salt tolerance is not as big an issue as most might think for a garden right on the oceanfront.. On this part of the coast WIND is the big problem. Most things that grow in "Paradise" are not considered salt tolerant. As long as they are protected from the wind they thrive. Windbreaks range from foliage to very effective louvered wind walls. We are at the extreme upper tip of USDA Zone 10, usually protected from frost and freezing by the water all around us. The Atlantic to the east, the Banana River just across the road to the west and all the ponds within the garden moderate cold fronts in most years. We are able to grow tropical waterlilies year round and have tended to slant our collection toward those that don't go dormant such as N. ampla and N. micrantha hybrids. Night bloomers do the best in the cooler months with few exceptions. Hardy lilies and lotuses don't do very well for us, perhaps because we don't get quite cold enough. The same goes for many marginals - those that do well here are the same as those found in local ditches. Victoria has become a major focus of our interest in aquatics. We have become the primary producer of hybrid and cultivated species seeds which are distributed around the world. We have also created several new cultivars that have proved to be very interesting. We have the unique opportunity to observe the plants almost 24-7 and sometimes year round. Orchids and other exotic tropical plants are other areas of special interest and have their own corner which we call the Magic Garden. "It must be magic because these things shouldn't be able to grow this close to the ocean." Our favorite orchids are the big Spatulata Dendrobiums, though the collection includes many other warm and intermediate growers. We also especially enjoy aroids, gingers, heliconias and ferns. We rarely improve the soil which is only slightly better than beach sand. We do water and fertilize regularly and we do the garden work ourselves. 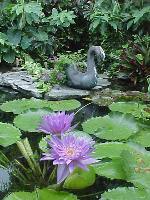 We have built all ponds, garden structures and features ourselves and do all the maintenance. First the fringes of Hurricane Charlie shredded the foliage in the garden. 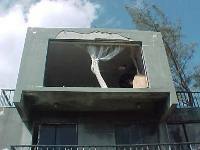 Three weeks later we were struck by the northeast quadrant of Hurricane Frances, pounded by hurricane force winds for more than 24 hours. Damage to the house was relatively small but the garden was buried in sand and debris. We were helped with the digging and dragging out by friends, many from this web site's email discussion list. 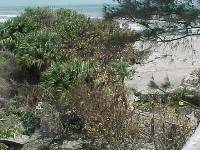 Next a remnant of Hurricane Ivan both eroded the beach and blew more sand into the garden. Exactly three weeks after Frances, just when we could say the interior part of the garden was almost back to relative normalcy, we were hit by the fury of Hurricane Jeanne, which was of shorter duration but more powerful than Frances. This time the garden damage was less (the worst had already been done) but the house suffered greatly. We have found it hard to believe that, in one year, the garden has been dug out and has grown back to the point that only we know what has been lost. The house reconstruction was completed in March. 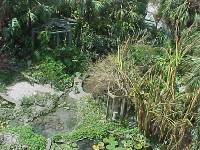 Prior to the hurricanes, we opened the garden to the public one afternoon a year, in mid- to late June. Smaller groups and individuals come year round.